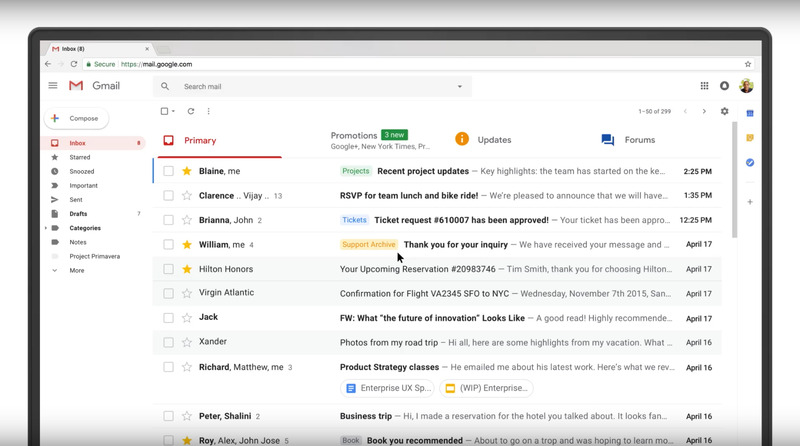 GoogleThere are numerous new things on Gmail’s new web interface. We’ll step through each of them below. 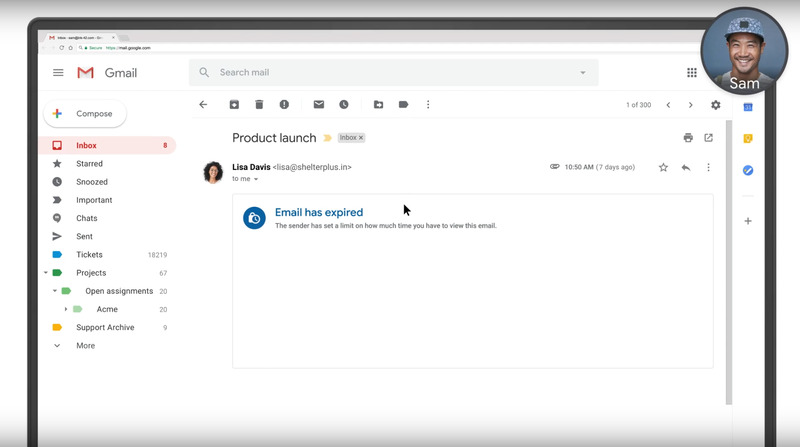 Google’s Gmail is getting its biggest refresh in years, the search giant announced in a blog post on Wednesday morning. 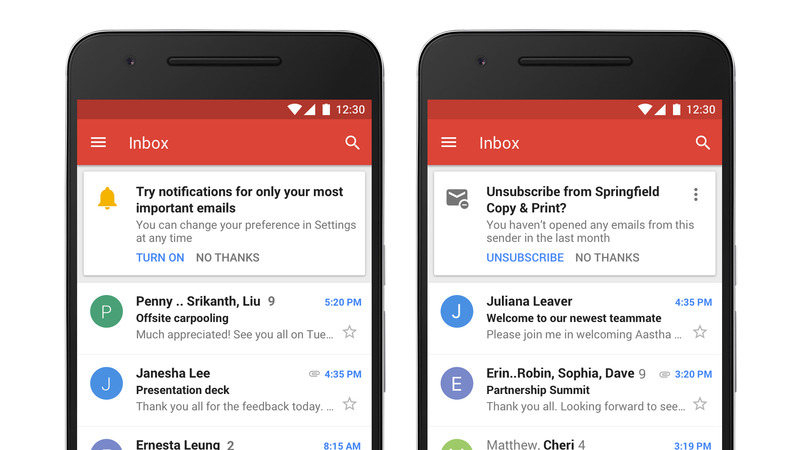 You can try it all out by clicking “Try the new Gmail” under settings in your Gmail account. That means a shiny new look, sure, but also some useful-sounding new features. 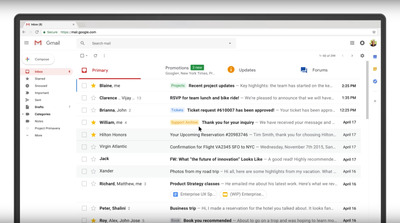 The updates are planned for Gmail on the web as well as for Google’s Gmail apps for smartphones and tablets. Some of those updates appear to be most useful for businesses, with others designed for consumers. We had an inkling these updates were coming. Screenshots obtained earlier this month by The Verge and Android Authority hinted at the news. Now it’s official, and we get our best look yet. 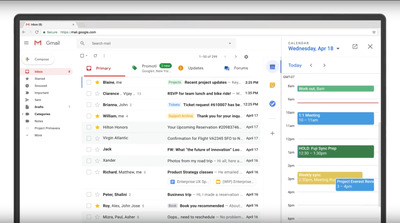 A huge component of Google’s redesign is Gmail’s integration with other Google apps, like Calendar, Keep, and Tasks, which can now be accessed via a side panel in the web version. When you click on an icon in the panel, it pulls out so the screen is shared between Gmail and a preview of the selected app. No more switching tabs to access your Google Calendar. 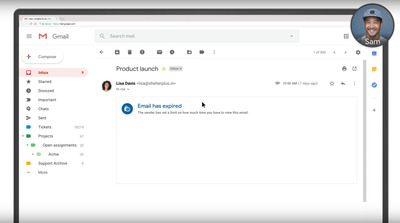 The blog post says the panel should also work with Gmail Add-ons, which are third-party business apps, like Trello, that are already available on Gmail. 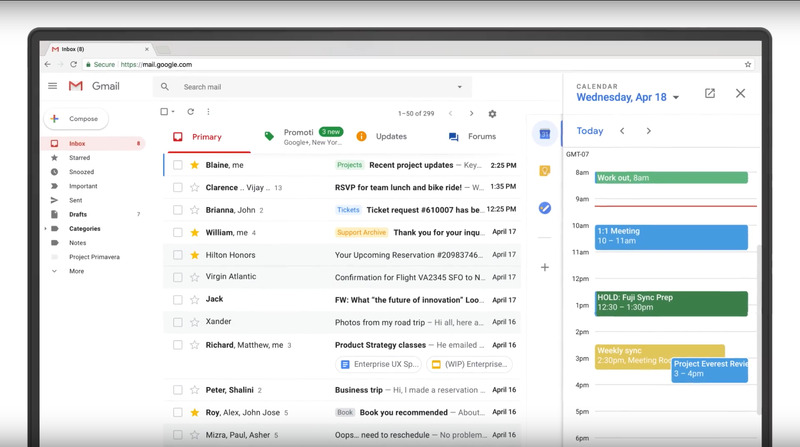 We can also expect to see the panel show up in other apps in Google’s G Suite in the coming months. 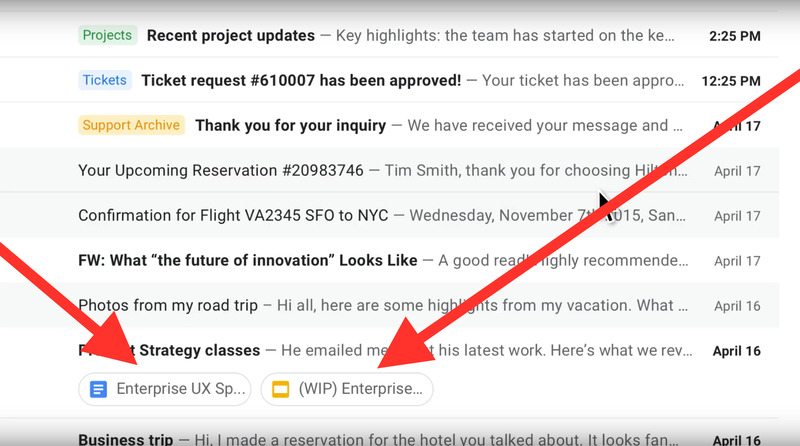 When you hover over one of your emails, options will appear to the left to archive, delete, mark as unread, or snooze. That last one is another new feature for the web version. 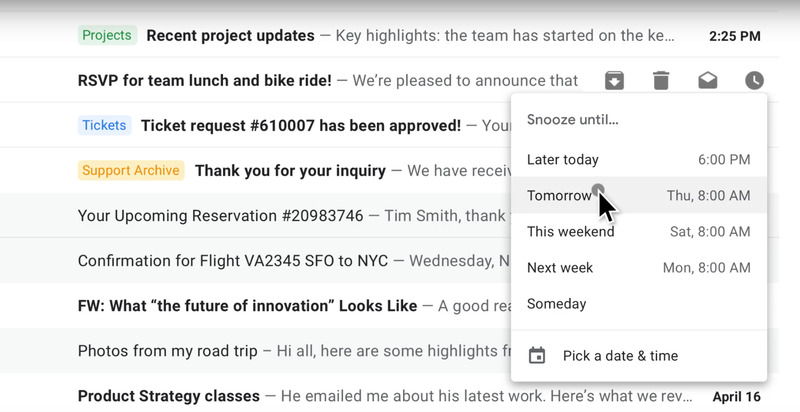 Snooze lets you decide when you want to be reminded about the email. Select how long to snooze it, and it removes the message from your inbox until the timer is done. This feature may look familiar to Gmail app users, since it’s been available on the mobile version of Gmail for some time now. 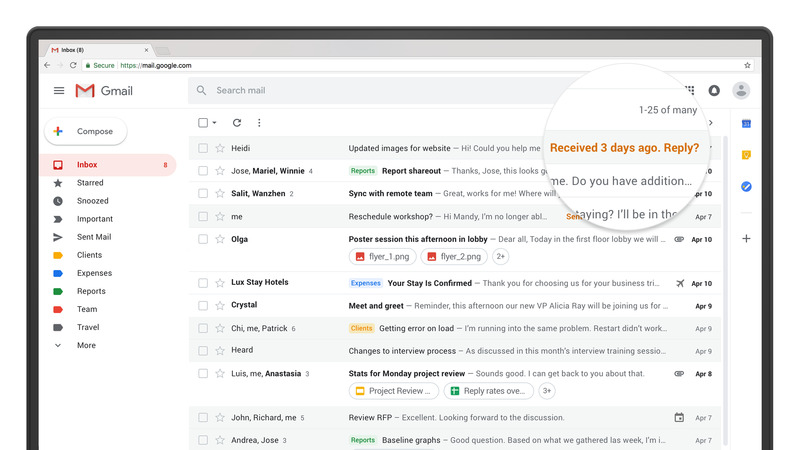 The Nudging feature is also a reminder mechanism, except it displays the reminder in text next to the email if you haven’t responded to it in a few days, and can be used for both inbound emails and outbound emails. You’ll see a notification if you haven’t responded to an email in two to three days or if you’re expecting a response to an email and the recipient hasn’t responded. This could be a pretty ineffective (and annoying) feature if it notified you about every email you hadn’t responded to in a few days. 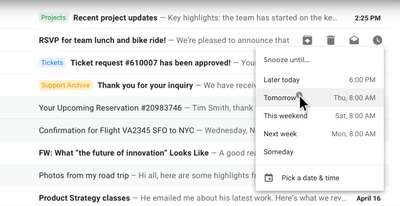 Instead, Nudging uses artificial intelligence to determine when the notifications are necessary by considering things like email participants and content, a Google representative told Business Insider. Attachments are accessible without going into the email, since they show up as clickable rounded icons under the subject. 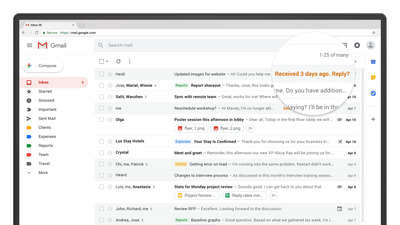 It’s designed to make it easier to find important files in your inbox. When you open an email, you’ll see Smart Reply options — another feature Gmail app users will be familiar with. 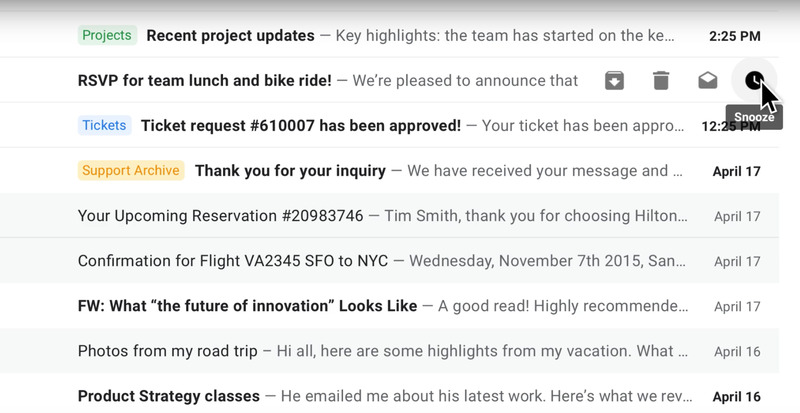 The feature suggests one-tap responses by scanning your emails and guessing how you may want to respond. Android Authority/David ImelThis image was obtained by Android Authority after G Suite administrators received the first email from Google. When you respond to an email, or go to compose one, you’ll soon see an option to activate confidential mode. 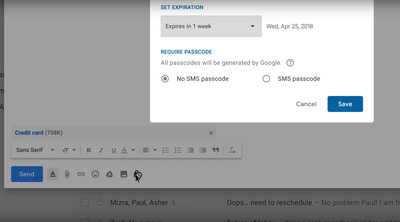 This lets you create expiration dates, or revoke previously sent emails, for security purposes. If you send an email in confidential mode, the recipient is informed about the expiration date in the email. The message disappears after the allotted time — no forwarding, downloading, or copying the contents after that. 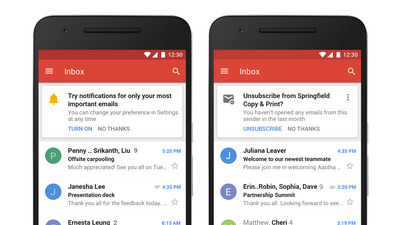 Gmail for smartphones is getting updates, too. For instance, a high-priority notifications setting is designed to ensure you get push alerts only about important messages. Otherwise, they will stay waiting for you to open the app. 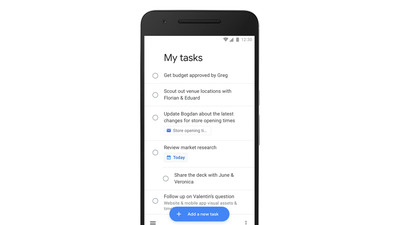 Google Tasks, the to-do list, is getting a redesign on both web and mobile. 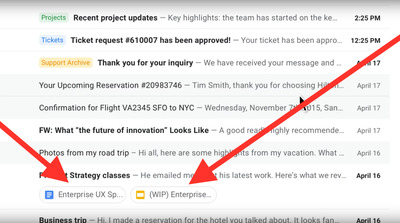 Users will be able to drag an email into the Tasks side panel to create a new To Do item, and they can also assign due dates that show up in the Calendar. You can get the new Tasks from theGoogle Play Storeor the Apple App Storeright now. To activate on your personal account select “Try the new Gmail” under Settings in the top right — that changes to “Go back to classic Gmail” if you change your mind. Businesses can opt in for the new Gmail, too, by joining the Google G Suite Early Access Program via the admin console. Confidential mode, Nudging, unsubscribe suggestions, and high-priority notifications are set to roll out in the next few weeks, but other features (hover, side panel, attachment icons, Snooze, Smart Reply) are available on Wednesday, April 25, to anyone who opts in.